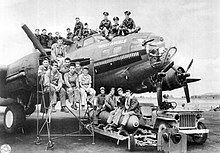 ^ "Hells Angels vs. Memphis Belle, Historical Information" (PDF). 303rd Bomb Group Association. Retrieved August 11, 2008. ^ "The Fall of the Counterculture : Preview". Bu.digication.com. Retrieved November 30, 2014. ^ "Interview with Sonny Barger". Pdr.autono.net. Retrieved June 18, 2013. ^ "FBI Safe Street Violent Crime Initiative Report Fiscal Year 2000" (PDF). Archived from the original (PDF) on September 13, 2001. Retrieved August 13, 2010. ^ a b "History". Hells-angels.com. Archived from the original on July 14, 2008. ^ zzfritz, Fritz Clapp (October 7, 2009). "Fritz Clapp Tweet". Twitter. Retrieved October 7, 2009. 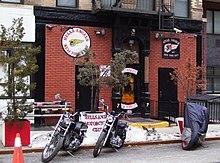 ^ "Attorney for Plaintiff : HELLS ANGELS MOTORCYCLE CORPORATION" (PDF). Archive.org. Retrieved November 30, 2014. ^ Weiss, Debra Cassens (December 3, 2013). 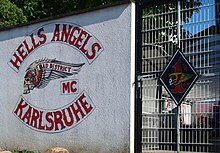 "Hells Angels club sues often to protect its intellectual property". ABA Journal. Retrieved December 30, 2013. ^ "George Harrison's memo to Apple staff about the Hell's Angels, 4 December 1968". Beatlesbible.com. December 4, 1968. Retrieved November 6, 2013. ^ Chris O'Dell (October 6, 2009). Miss O'Dell: My Hard Days and Long Nights with The Beatles, The Stones, Bob Dylan, Eric Clapton, and the Women They Loved. p. 68. ISBN 1416590935. 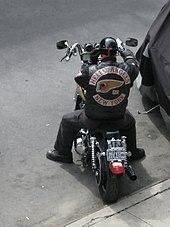 ^ "Hells Angels MC London History". Archived from the original on May 9, 2009. ^ a b "Sonny Barger Interview". Let Them Talk. Retrieved June 18, 2013. 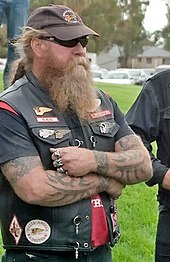 ^ "Soul on Bikes: Tobie Levingston: 9780760317471: Amazon.com: Books". Amazon.com. Retrieved June 18, 2013.